It is with some interest that I read the latest assertions by historian Thum PJ on how Lim Chin Siong was wrongfully arrested for inciting a riot in 1956. According to Thum, he had discovered an archival record which contained the transcript of Lim Chin Siong's speech during the night of the riot and that in this record, Lim Chin Siong did not ask the people to “pah mata” (beat up the police) but wanted the police to join him and his cause. Thum proceeds to assert that the subsequent arrest of Lim is wrong and thus, fits into his persistent historical assessment that Lim was not a communist - although Lim had joined the outlawed communist Anti-British League and rose to prominence in several communist trade unions. If it was not Lim's fault, than whose fault was it? Why was the crowd so worked up that day and not any other day? Having absolved Lim from all responsibility, Thum's historical investigation is reduced simply to the claim that “public anger was too strong” and therefore the riots occurred. So the elephant in the room was, why was public anger so strong on that day, as claimed? This, Thum did not bother to find out. Only those present at that historical moment can understand what Lim spoke ahout and what he wanted the people to do. If I were to read this historical document now, I would also wonder why I was so angry then. UNLESS you read through the entire document, you will find how words were played with sparks and could possibly set off fire. As a historian, Thum is entitled to make his assessment. But even my lecturer constantly drilled me to question sources and not make simplistic prima facie assessments from one single historical source. For example, CPM chief Chin Peng said in his memoirs that left-wing trade unions in Singapore were receiving instructions from the communists. 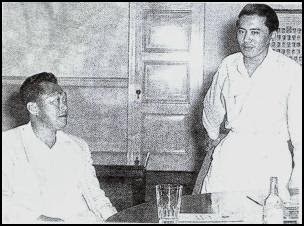 The Plen, Fong Chong Pik, in his memoirs, said that he had a “special acquaintance” with Lim and had met him 3 times. In fact, it was the British Security Council assessment that also pinned Lim as a communist...so Chin Peng, The Plen and the Brits were all lying about the same thing?! So there were no communists, no riots, no bombings? Or all these just random acts of “public anger” also? Now, for Thum to put the blame of the riot on “public anger” is perhaps somewhat disrespectful to those who there on that night. Cuz Lim Chin Siong would never lay the blame on the people. What Thum said is not new at all. In fact these opinions have been floated around by alternative historians since a decade ago. This SDP article below is actually almost identical to Thum. This looks like a political exercise by Thum to gain readership. Funny thing is we have rely on an Oxford scholar to revive the reputation of one the most charismatic Chinese speaking leader in Singapore! Lim's speeches must be taken as a whole because throughout the whole of Sep-Oct 1956, Lim's actions further inflamed the Chinese community's unhappiness with the authorities leading to riots, unrests and deaths. Of course, Lim was smart enough not to incite the masses directly, otherwise he would long be already behind bars. I think one could pick many paras where Lim did not incite the masses, just as one could pick those which he did incite the masses. ...It was a straight fight between an employer who had decided, the day the union was formed in his company, that he was going to crush it, and who then systematically set out to recruit redundant workers whom he fed at two dollars a day, whom he forced into his own union. He just waited for the time which he knew was coming when wage claims would be made, and an industrial dispute would arise, and either they would go on strike, in which case he would just carry on with his new workers; or he would dismiss them, which was what he did. It was a plain straight fight for survival. That was the basic cause of the bitterness, the hostility, the anger in the dispute... "
Lee Kuan Yews testimony in Parliament can be read from column 200 to 218.